Pork roll is a type of breakfast meat originating and commonly available in and around New Jersey and select areas of Philadelphia. The product, as it is made today, was developed in 1856 by John Taylor of Trenton, New Jersey, though several firms produce their own versions. The meat is pork roll, while Taylor Ham is a brand that produced the product. The product is generally eaten sliced and pan-fried or grilled, but can also be prepared in the microwave. A common practice is to slice four cuts from the outer edges inwards about 3/4 inch to an inch towards the center, evenly spaced around the circumference. These cuts prevent the pork roll from curling up in the middle, which causes it to cook unevenly. With these cuts, the cooked slices have become known by many different names such as fireman's badges or Pac-Man bacon. More recently a "swatch rocket", touted as "New Jersey's answer to the Philly Cheesesteak", has been described as grilled Taylor ham sliced longitudinally and served on a soft hoagie or frankfurter roll with Dijon mustard, melted Muenster cheese, and optional relish. 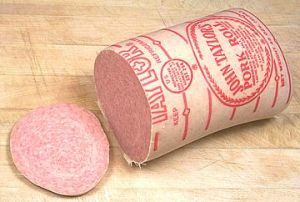 Though typically eaten as part of a sandwich, pork roll can also be used in many other recipes. Depending on the type of sandwich and the location within the region, popular condiments and toppings include salt, pepper, ketchup, mustard, hot sauce, lettuce, and tomato.